Big Daddy & BekBek: Help!!! The last 6 months I have been having a REAL BIG problem. I have been having GIGANTIC hot flashes. I mean they come on fast and furious and rage on for several minutes and then go away as quickly as they came. I get really hot, then water just starts pouring down my face and neck. I feel rivers running down my back. My underwear is stuck to my body most of the time. I usually allow myself three times that I will blow dry my hair and then I give up and just pull it back. This goes on all through the night too! I have been patiently enduring this, thinking that it was all part of the 'game'. But I am so tired of it all. I thought maybe this distress was due to medication...or the illness...I never dreamed that maybe it was MENOPAUSE! My mom told me that some of her friends...(mind you they are over 70 years old!) 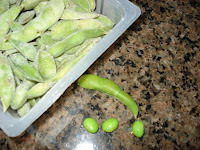 have these hot flashes and have been able to control them with EDAMAME. That is the fancy name for soy beans. After I asked every Dr. that I go to about these annoying and uncontrolable heat waves...and...they said they had no idea what would cause this...of coarse when was the last time they DID have an idea? Anyway, I decided to try the edamame. After about five days I noticed a big difference. It has been ten days now, and I have had only a few hot attacks and only one that was really bad! I think edamame works! I am saved! I can go on! I HOPE that I can be hot flash free. I am passing this news along so that maybe someone else can have their life saved or that of a loved one. so how do you use them? Do you just cook 'em up and eat them. That is awesome. I have to admit...I tried them and they are pretty good. Anything that will make you better mom...GO FOR IT. I love ya and hope you smile when you see this. YEAH! So glad you can finally find some relief from those horrible hot flashes! I love you and I so lucky to have you as my Mom and aslo as my Friend. you da bomb mom! Oh Mom, I am so glad that it is really working! You are such a tooper, but I am so happy to know you are feeling relief in that area! Yeah for SOybeans. I will have to remember that!